These sandwiches evoke a special memory. 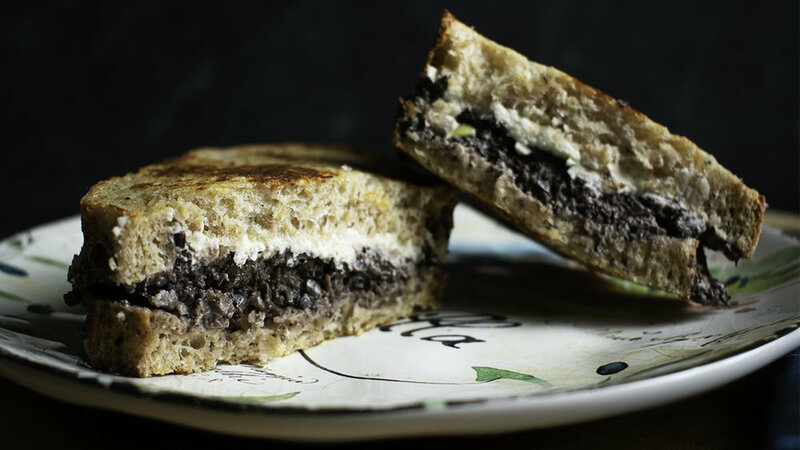 On one visit to New Jersey by my sister and her daughters, I made and packed grilled tapenade and goat cheese sandwiches for our trip into New York City. We ate them on the train, and everyone loved them—they still talk about those sandwiches years later! Once I became a vegan, I feared that I’d never make them again. But now I can make them, even without butter or oil, and they taste fantastic! They take me back to that train ride and the wonderful day trip we had. Adjust portions for as many sandwiches as you need. 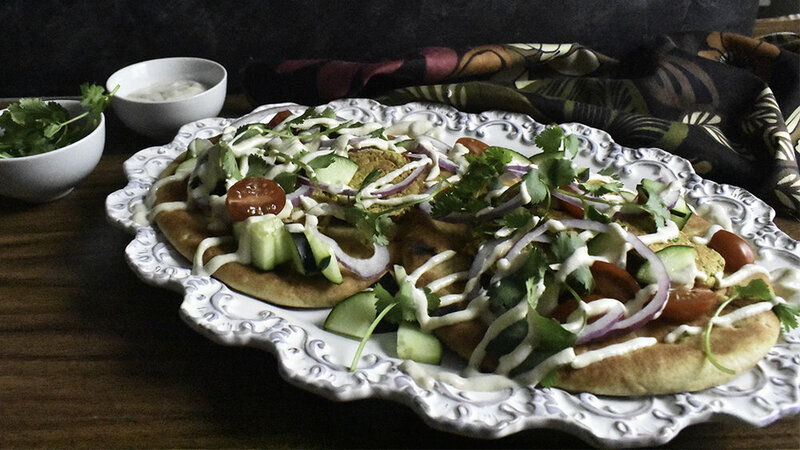 Spread one side of each slice of bread with mayonnaise or a very thin layer of tahini. Join together the two sides with mayo or tahini and lay the pairs on a plate or counter so you can spread the fillings on the top slice. Spread a thin layer of olive tapenade on the bread. Then make thin slices of the goat cheese and spread them as much as possible on top of the tapenade. Heat a skillet or griddle to medium-low. Uncouple the two pieces of bread. Put the one with the fillings on it mayo-side down on the griddle. Top that slice with the other piece of bread, mayo-side up. Cook for 2-4 minutes, until the bottom is golden (it can burn quickly). Then carefully flip the sandwich over. Cook for another few minutes until the second side is golden. Serve and enjoy! These sandwiches are great for picnics or just a nice meal at home. The creamy pesto spread makes people curious -- "What's in this? It's delicious." You can customize the rest based on taste and what you have in the house. Creamy pesto spread. Put the almonds in the blender or other container. Pour in enough water so that the water line is at least 2 inches above the almonds. Let them soak an hour or more. Drain and rinse the almonds in a colander and put them back into the blender. Add the following ingredients and blend until smooth. Add extra water a tablespoon at a time if the spread is too thick. Taste and adjust seasoning as desired. Cut the avocado in half, remove the pit and skin, and slice into thin wedges. To assemble, take a slice of bread or a roll, smear an eighth of the spread on it, and layer on the vegetables, avocado, sprouts/spinach, salt and pepper. Wrap the sandwiches in parchment or wax paper if you’re transporting them. Or eat immediately. I developed this recipe for a recent "Tempeh and Seitan" demo for Northwest Veg here in Portland. You could switch out the seitan with tempeh or tofu. “Banh mi” is the Vietnamese term for “bread,” specifically a baguette-type roll that is a basic staple in Vietnam. There was a French presence in Vietnam for hundreds of years, leading to this fusion bread. The Vietnamese version has a thinner crust and contains rice flour as well as wheat. Pickled vegetables (enough for 4 sandwiches). These can be made up to several days ahead (in fact, that improves the flavor). Pour the pickling ingredients into a glass or plastic container with a lid. Shake or stir to dissolve the sugar and salt. Add vegetables. Add more water if needed to cover them. Secure the lid. Refrigerate until ready to use. It's best to give them several hours, if not a couple of days, to pickle them. Seitan for Banh Mi (enough for 4 sandwiches). In a shallow dish or a Ziplock gallon bag, mix the marinade ingredients together. Add the slices of seitan and let them marinate for at least 20 minutes (preferably several hours). A few minutes before assembling your sandwiches, heat a large skillet on the stove. Pour the seitan and all the marinade into the skillet and cook on medium heat, stirring frequently, until the marinade is mostly absorbed, anywhere from, say, 3 to 10 minutes. I remember the first time I tasted a muffaletta sandwich. It was at the New Orleans Jazz Festival a few years ago. They looked surprised when I asked them to leave off the meat and cheese--I just wanted to olive salad. I adore Greek olives and I can't get enough of tapenade, a spreadable paste made with olives, so I was sure I would like this sandwich topping with the quirky name. With muffaletta, celery and caper flavors pop out on top of the briny base of olives, shallots, and red peppers. All my senses were more than pleased that afternoon. You could make a muffaletta sandwich with this olive salad and vegan cheese (like Chao, since its original flavor tastes a lot like provolone cheese). Or you could use a hummus base, like the open-faced sandwich pictured here. Muffaletta would also be good with vegan cream cheese or with roasted vegetables. Of course you could use this for appetizers--serve with crackers or small slices of baguette. Combine the ingredients in a bowl and stir. It's ready to use on a sandwich or for appetizers. Link to Tex-Mex-Style Soft and Chewy Flour Tortillas recipe. GV comments: Not long ago I was an hour away from dinner and realized I'd forgotten to buy flour tortillas for my Gracious Vegan Vegetable Fajitas. Instead of making a round trip to the store, I decided to try out a recipe for homemade flour tortillas, which always taste better anyway. My internet search quickly surfaced a recipe from Serious Eats that sounded exactly what I was looking for--soft and chewy. I was amazed at how easy the recipe was. There's much more time letting the balls sit than there is hands-on time. Next time I'm going to try using half whole wheat pastry flour. Of course I used vegetable shortening (I use Spectrum brand) instead of lard. These are worth the small effort, and your friends and family will be impressed! Nutrition: If you use half whole wheat flour it will help. Otherwise it is mostly processed foods (flour and shortening). I have not tried this with gluten-free flour. GV comments: This dish is easy, inexpensive, fast, and nutritious. Plus it can be gluten-free with the right choice of bread. It’s delicious, and there are lots of options for customizing it to your tastes. It's best when eaten fresh, so I don't recommend mixing a full batch and eating it for days: keep the ingredients stored separately or in groups, then mix fresh before you make the sandwich.